The new Christopher Robin movie is now available on DVD, Blu-Ray and Digital. Bring it home to share with the family. Keep reading to find the giveaway! Disclosure: We received a copy of the movie in exchange for this post. This post contains affiliate links. As you can probably tell from the image above, the non-people characters look like fuzzy stuffed animals. Their voices are similar to their originals and the story is believable. The movie was sweet and touching and would make a great gift for those who grew up with Winnie the Pooh. 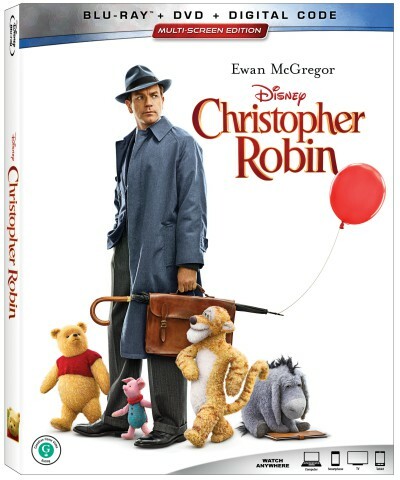 Thanks to Disney, I have one Christopher Robin combo pack to giveaway to one lucky CANADIAN resident. You can enter on the form below. You must be 18+ or older to enter and a Canadian resident (Not from Quebec, sorry) Full contest details can be found on the Giveaway Terms page.